Camping Perticara is small-scale, but spaciously appointed. The site has three stars and rightly so! In addition to its spacious pitches, extensive and clean washing facilities, a bar, the large heated (25°C) swimming pool with separate toddler pool and the relaxation area with parasols and recliners, there are plenty more extras. Camping Perticara is a terraced campsite. 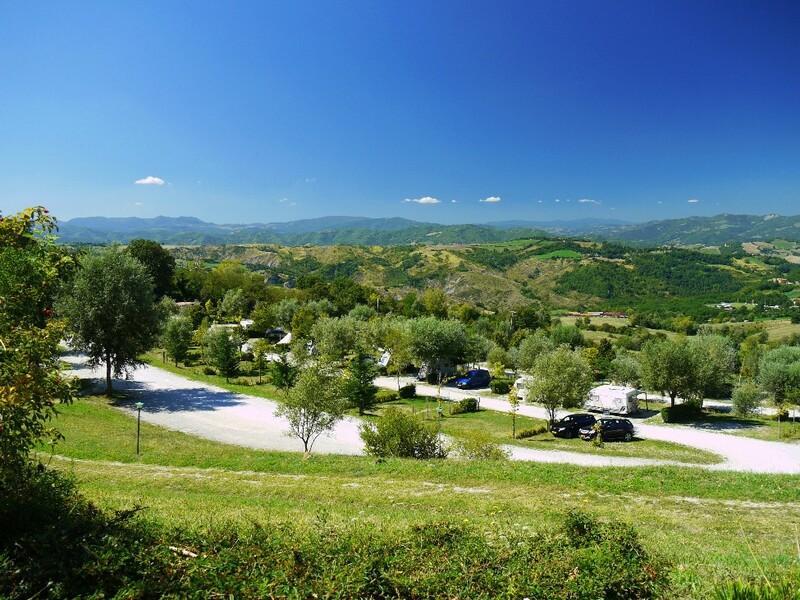 This gives you a panoramic view of the valley and the village from the 70 camping pitches and the 2 apartements, 2 maxi-caravans, 2 mobile homes and the chalet. The camping pitches have privacy thanks to the separations between the pitches and the spacious dimensions of approx. 100 m2. The campsite offers; luxury and clean bathrooms, a bar / terrace, a large and heated swimming pool and free sun beds. Thanks to the location of the campsite at a height of over 600 meters, there is always a cooling breeze during hot summer days. And there are few mosquitoes to be seen. You can come to reception in the main building at any time to find information about the campsite, the area and tips for day trips. Next door to reception you will find a little camping shop with a modest, well thought out range. The baker delivers fresh bread each day, and you can sign up for this the day before. And you can also buy Dutch daily newspapers. Enjoy a refreshing drink on the large terrace as you look at the glorious view. The bar is open all day and every evening. In addition, a local restaurant at the campsite serves Italian (Romagna) dishes such as bruchetta and tortelli (stuffed pasta). Depending on the season, the restaurant is open several evenings during the week. Dogs (pets) are not allowed on the campsite, in the apartments, maxi-caravans and chalet.